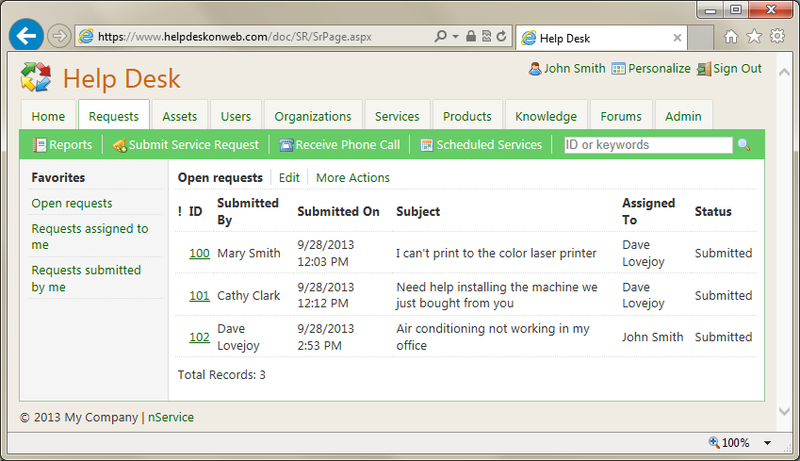 nService is a web-based help desk software product. Customer service can use it to set up a support website to help their customers. IT can use it to set up an IT help desk website to provide IT services. Facility management, HR, and other departments can also offer their services on the help desk website. Users come to the help desk website to search the knowledge base, submit service requests (or tickets) and check their status. Technicians use it to assign, respond to and resolve service requests. Managers use it to manage the services their departments offer. I have been impressed with your nService help desk system. It has always been efficient and simple to use. Users can track their requests easily and they feel like their requests are responded to in a timely fashion. Technicians can quickly glance at their workloads, see what they need to do, and get to work. Managers can get the reports they need and escalate issues easily. It is a perfect fit for our organization since it integrates with Active Directory. All of our users and their contact info are automatically imported into the system, so we don't have to worry about account maintenance within nService. Most of our users enter their own tickets, which lets us keep our focus on getting the work done. It is also a huge time saver that when users email our help desk, a ticket is automatically generated and populated with their contact information from Active Directory. For the server computer where nService is to be installed: Windows Azure, Windows Server 2008/2012 or Windows Vista/7/8, and MS SQL Server 2005/2008/2012. Users can access nService using any web browser from any operating system. You can download free SQL Server.